Bozeman is surrounded by mountains, so it’s little wonder that the locals spend much of their recreation time exploring them. 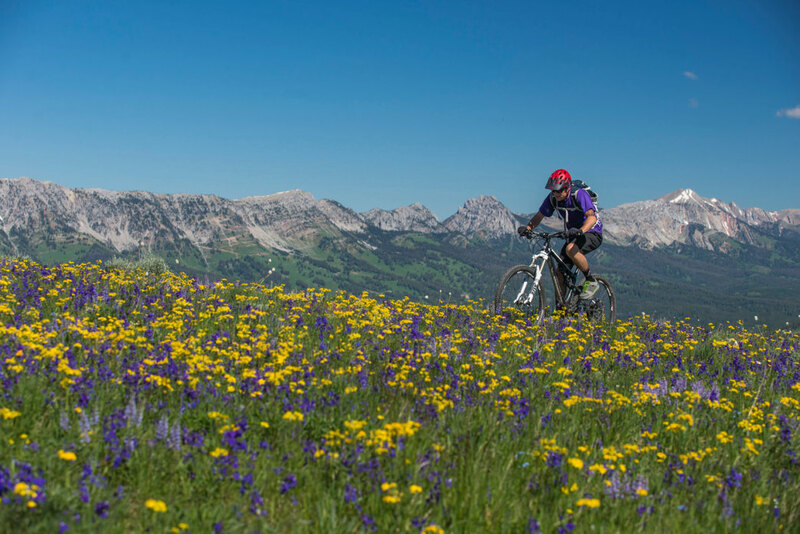 Thanks to a bustling cycling community, mountain bikes are a common sight in Bozeman, and riders of all skill levels and preferences will find trails to explore. Whether you’re looking for a lung-busting climb—and the subsequent adrenaline-jolting downhill—or a more mellow, rolling ride along mountain creeks, the Bozeman area won’t disappoint. Here are seven of our favorite area trails. The 18-mile loop at Mystic Lake offers a mild 700 feet of elevation change and an intermediate rating. The ride starts smoothly on Sourdough Mountain Road, branching off at a bridge at 4.8 miles and then again a bit later to the left toward Mystic Lake. The trail meanders through the forest, eventually winding along the scenic lake, where there’s a Forest Service cabin for rent for those wanting a weekend escape. At approximately 10.5 miles riders reach the locally named “Wall of Death,” a sheer wall that, with a bit of careful consideration, is readily doable. Overall, this is a scenic ride with options to stop, rest, and play at the lake. The 6-mile Leverich Trail features uphill (east portion of the trail) and downhill (west portion of the trail) sections, allowing bikers to cruise and flow down the steep descent. This singletrack loop features 1,500 feet of elevation change and a few small jumps—plus some banked turns for fun downhills. The trail is heavily used by hikers, but those on foot and on horseback are asked to use the eastern side of the trail, leaving the western side free for bike-riding adrenaline lovers. A popular hiking trail, South Cottonwood is equally as welcoming to mountain bikers. The intermediate-rated 6-mile trail gains 800 feet of up-and-down throughout its length, and it features a few creek crossings with narrow log bridges. The first 2.5 miles are gently rolling (the moderate pitch from the parking lot is the hardest climb) and suitable for riders of all levels. The remaining 3.5 miles grows increasingly challenging. Often completed as an out-and-back, the trail also connects to other trails for loop options, but riders should come prepared for massive climbs and serious commitment. The true beauty of South Cottonwood lies in the options for all skill levels. Thanks to its short (about 3.5 miles) distance and varied terrain, Truman Gulch is a post-workday favorite for Bozeman athletes. The singletrack has 1,200 feet of elevation change and is rated advanced thanks to a technical upper half with steep climbs and rocks and roots to navigate. The first half of the climb moves through shady trees, along a creek with a few crossings, providing a timely cool-off on hot summer days. The descent requires a bit of care as it’s easy to gain speed and then meet unexpected twists and turns. This trail is popular with confident, thrill-seeking riders. One of the Bozeman area’s most storied trails, Bangtail Divide is best ridden from south to north. The 24-mile ride kicks off with a plethora of switchbacks that warm riders up quickly, then levels out to stunning views and rolling hills. The singletrack has an elevation change of 5,100 throughout the loop, and while there’s another hearty climb near the end, riders are then treated to several miles of downhill. The trail is known for its gorgeous views and lush wildflowers in the early summer months. Pack a lunch and start early to avoid hot summer days. Many riders herald Emerald Lake as the best ride in Montana. The 10-mile out-and-back trail boasts 7,406 feet of elevation change and is rated as intermediate. Riders face a lung-busting 2,000-foot climb to stunning Emerald Lake (pack fly fishing gear and a lunch), but they can enjoy the adrenaline-filled ride back down. The trail is popular with hikers and horseback riders, so many mountain bikers choose to explore Emerald Lake on the weekdays where you’ll find limited trail traffic. The Hyalite Creek Trail is a stunning canyon ride leading to a classic alpine cirque and lake. The trail passes 11 waterfalls along the way (some require a slight detour, but are worth the look) and is open to bikers on a shared use schedule, as it is quite popular with hikers and horseback riders. The 12 miles of singletrack has a few gnarly sections as it gains 6,818 feet of elevation, but the views from the out-and-back are well worth the sweaty ride and sometimes crowded trail conditions.